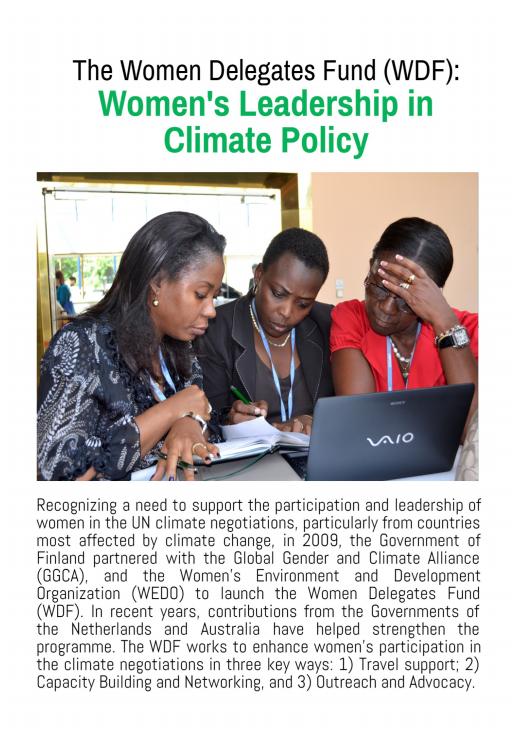 Recognizing a need to support the participation and leadership of women in the UN climate negotiations, particularly from countries most affected by climate change, in 2009, the Government of Finland partnered with WEDO, UNDP and IUCN to form the Global Gender and Climate Alliance (GGCA) and launch the Women Delegates Fund (WDF). WEDO has been administered the programme, and the fund supported 86 women from 52 countries to participated in UNFCCC negotiations. Learn more facts here.